I always get this dish at the take out places - its my comfort food. Love it with just rice and a dash of Maggi sauce. Yeah it's so simple and tastes so good! I always order that at the take out place too! Your salad with tomatoes, basil, and goat cheese looks yummy! I was watching a Taiwanese cooking show here in Taiwan, and yes...that's how the chefs do it too! Smooth silky eggs, almost like those (smooth eggs) "Wat Dan" (like in Hong Kong). Hey! 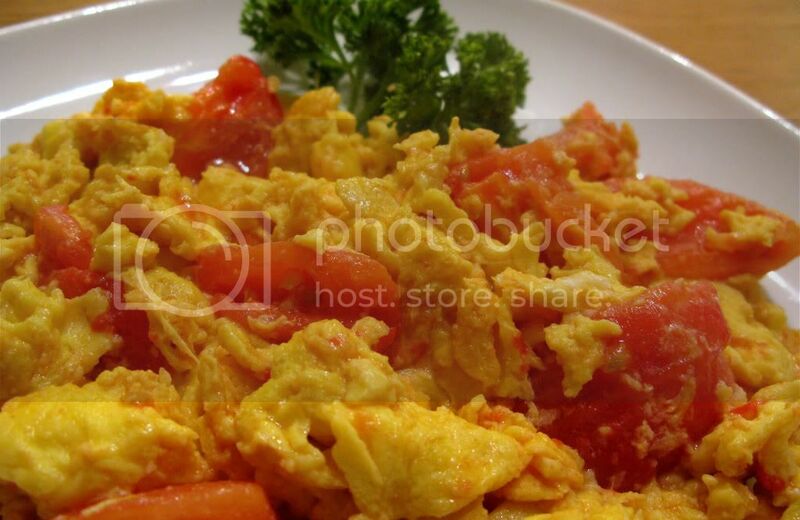 We both have scramble eggs on our latest post. Can we swap? Your truffle and the egg looks yummylicious! I like watching the one at SET TV. At least that will keep me happy for a while. I heard a lot about that show but never watched it. I remember when I was in Taiwan, I always watch those Japanese cooking competition shows, sooo good! Ahh memories. I lived in Taiwan for two and a half years and loved every minute of it. Although I don't like scrambled eggs I did eat this dish and I also liked the scrambled eggs with the little fish. Lately I've been really craving some Taiwanese food and I've been looking for recipes for the past two days. I'm sure my Taiwanese boyfriend loves that I want to make all these yummy dishes that I remember when living there. Keep me posted about the Olympic thing! I would just reverse the procedure: cook the tomatoes first and set aside, then cook eggs and wait till they are 70% cooked and add tomatoes. A nonstick wok works great. Thank you so much for the suggestion, my mom actually cook it that way sometimes. I'll give it a try next time too!